Runs for Cookies: Is it worth the points? 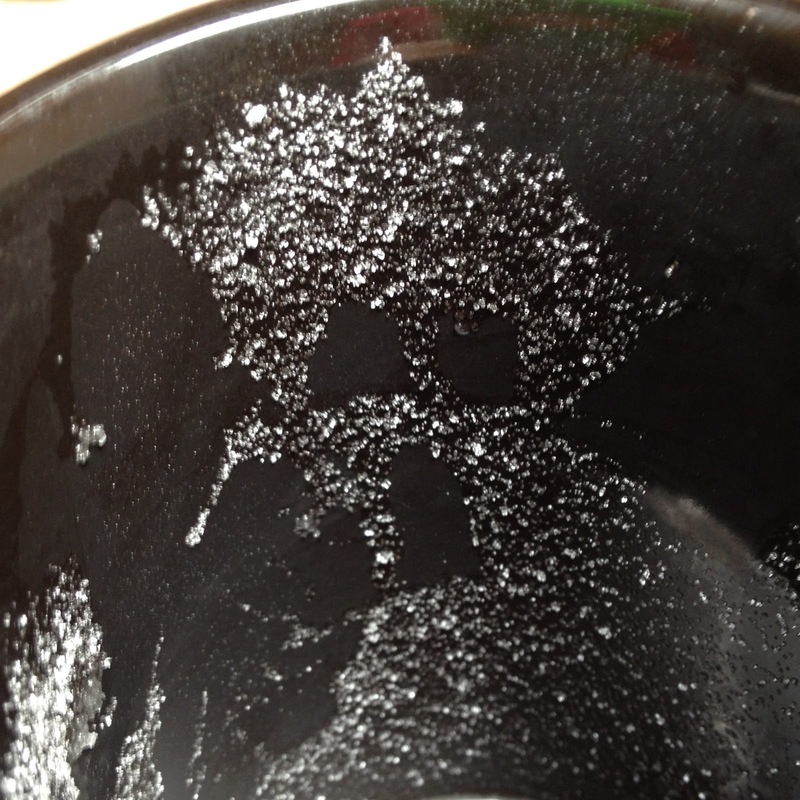 Apparently, my food was into making faces today, because while I was waiting for my tea to steep, I tossed a teaspoon of sugar into my mug, and saw a pretty ghostly looking face staring back at me. This face was a little creepier than my breakfast's face! After breakfast, I headed to my Weight Watchers meeting. Last week, I didn't weigh in because I had just gotten home from San Diego, and I knew I had gained about three pounds. Today, my weight was up 1.4 pounds from before I left for San Diego. So it's not all that bad! I fully expected to gain 10 pounds while I was gone. I've been back to tracking for a few days now, though, so it's (slowly) coming off. This month at WW, we've been talking about "IIWTP"--Is it worth the points? I think this is a fun topic, because I've learned so much since I started losing weight. When I was 253 pounds, a cookie was a cookie, no matter how it tasted. I never gave a single thought to whether it was good enough to be worth the points (calories)! I had the mindset that just because it was bad for me, it must taste good. When I started counting points back then, I was shocked at how many points it would cost me for a small cookie. I started to ask myself if it was really worth it. And sometimes, surprisingly, the answer was no. Some cookies are absolutely worth the points! But some just taste completely blah. I started to really pay attention to whether I really wanted a particular food, or if I just thought that I wanted it. One day, I did something I had never done before--I took a bite of a piece of cake, and realized it wasn't as good as I was expecting, so I spat it into a napkin. I had saved my points all week long for that piece of cake, and I was completely prepared to spend them and enjoy it very much. But when I took a bite, I realized the cake was a little dry, and there wasn't enough frosting for my liking. I decided not to waste my points on it, and I tossed out the cake. I love cake, and will happily save up my points to have some; but it better be damn good cake, or I won't waste my points on it. Sometimes, I'll work a food up in my mind for SO long--thinking about how good it is, and how I can't wait to eat it--and then when I finally take a bite, I think, "Really? THAT'S what I was looking forward to?" This actually happened recently, with the new Ben & Jerry's "Core" ice cream. I was dying to try the "Peanut Butter Fudge Core" flavor--because, well, peanut butter + chocolate? Yes, please! I kept looking for it at the store every time I'd go, but it hadn't hit the shelves yet. I saved up my points (a pint of that ice cream is 33 PointsPlus!) each week, until FINALLY, the store had it in stock! From the very first bite, I decided that it wasn't worth it. I've had much better ice cream, and I just didn't want to waste 33 points on ice cream that was anything less than mind-blowing. Before I lost the weight, I would have blown through the whole pint without even thinking about whether I truly liked the flavor or not. In asking myself whether something is worth the points, I've discovered that there are a lot of tempting foods that really aren't all that great! I only spent half of my activity points yesterday so that I could spend the other half today (my rest day). I'm holding on to my weekly points so I can spend them on something good for my long run day! I love this topic! Cheese is a big one for me. I love cheese, but sometimes it is just not worth the calories if it isn't great cheese, hahaha! 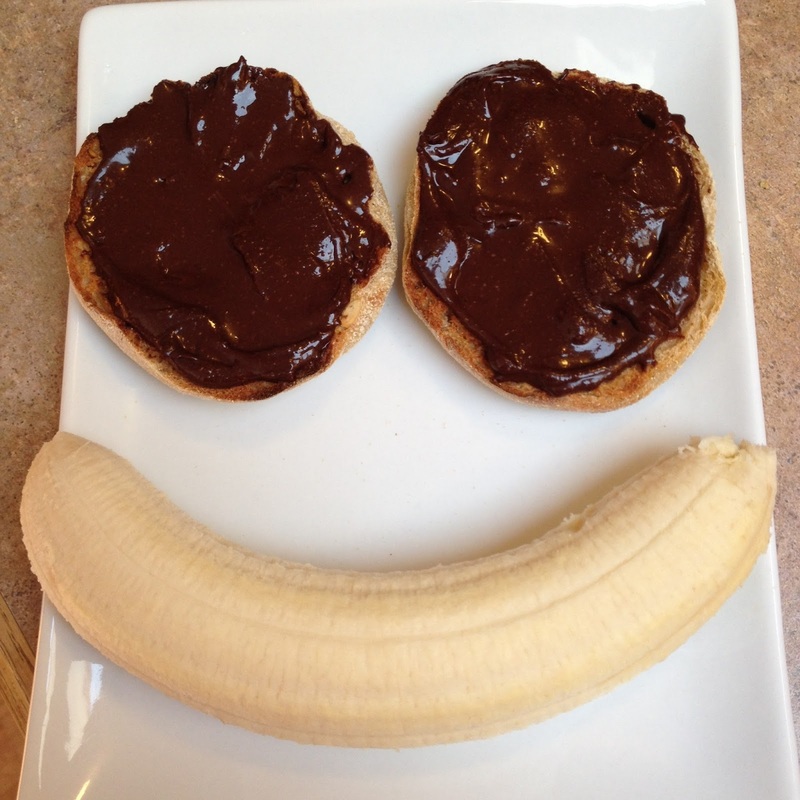 I love your smiling breakfast! I've been trying to more consistently ask myself IIWTP lately. It's hard sometimes. I'm with you though that I won't waste points on mediocre desserts! I don't want any non-fat cheese or ice cream. I'd much rather have a smaller portion of the real stuff. I get so frustrated in meetings sometimes when people are like "low-fat" this and "sugar-free" that. Just the thought of all that fake food makes me green (with nausea, not with envy). 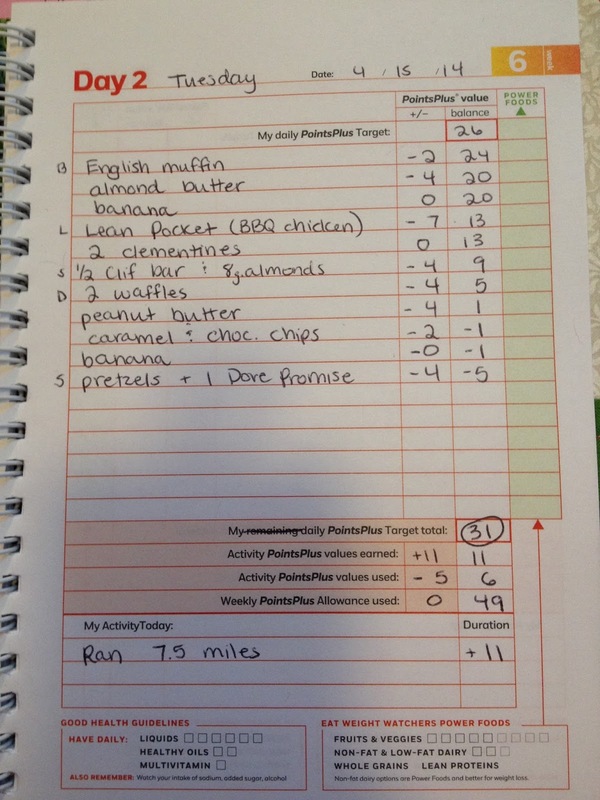 Do you feel that you track better when you write it down vs logging your food with an app? I'm in limbo on this topic. I also need to start thinking about whether it's worth it or not. Good on ya! We look at our calories for the day as a "calorie bank." On our high cal day, we have a rule that if it tastes like poo, don't eat it just because we paid for it. I'd rather throw something out and get something worth the calorie bank deduction than eat it just because it's there. When you save up for something that's worth it, it tastes that much better. I used to think this way, and I totally forgot that I ever did. Thanks for the reminder! I definitely had a few too many chocolates today that weren't at all worth the calories. I'll be asking myself this tomorrow for sure! This was a great meeting topic this week. It was fun to discuss. One thing I brought up at the meeting is that I often factor nutrition into whether something is worth it. If it doesn't have anything going for it nutritionally, then I want it to taste absolutely amazing to be worth it and even that might not be enough! Your breakfast looks so yummy and happy! I just tossed out a bag of mini marshmallow 3 musketeers bars. I bought them for my daughter and she didn't like them, and neither did I. I don't think I've ever tossed chocolate in my life -- but like you said, they really weren't worth the calories. In the past, I'd have eaten them anyhow. Breakfast looks really good. I have never had cocoa almond butter. Might have to look for that. Question....what brand of english muffins do you get that are only 2 points? I have never found any below 3 or 4 points for a whole one. They're the Healthy Life brand. They only have 80 calories each. Out of all of the "light" English muffins, this brand is my favorite by far! I don't usually comment (lurker here), but this really struck a chord with me today. I've been falling back into the "eating just to eat" or eating because I started it and it would be a waste to not finish it. I really need to start asking myself if it's worth it, because I'm terrified that I'm going to fall back into gaining. I'm still working on loss (30lbs gone, only 70 more to go! ), but I've gained the last three days in a row (just 4lbs, but any gain makes me worry). That scares me silly. I haven't been over-shooting my calories, technically, but I am eating back all I exercised, which I've never really done before (I try to eat about 1/2 or less). Thanks for this post. :) It was the wake-up I needed. Krista, I used to struggle with the thought of "wasting" food too! I finally managed to (sometimes) control that thinking by realizing that my overeating was just as wasteful as throwing it in the trash. At least by throwing it in the trash, I'd be saving myself the guilt and worry that would always come along after eating something I realized I didn't really want. It might not work for everyone, but it's helped me. I'm finding asking myself this question really helps me not waste points. I bought some frozen french macaroons from Trader Joes, but only liked 2 of the flavors, so I threw the rest away. Totally would have eaten the whole box back in the day. I need to learn to not eat stuff. The amount of cookies, ice cream, and cake I've eaten over the years just because it is a "treat" is mind boggling. I should be saving up for actual good treats! This is such a great topic, and I love the way you write about it. Your thought processes makes so much sense, and I realize as I read through it that mine actually along the same lines. There are a lot of things that I would've just mindlessly eaten before I lost the weight that I will set aside if I don't like the taste. Great post!